Our teachers are passionate about music and child development. All our teachers have passed a rigorous 25-hour training and practicum in order to become a Registered Music Together® Teachers. Every year, our teachers further their knowledge of child development, early childhood music development through ongoing professional development workshops. But most of all, our teachers know how to have a great time in class! Interested in teaching in a rewarding and educational musical environment? is the Director of Mindful Music and Arts and a lifelong music maker! Having grown up the daughter of music teachers, music making is an integral part of her family experience. Laurie started playing the piano at a young age and fell in love with the tone of the violin as a 5th grader. Having played and participated in youth orchestras in the Twin Cities she pursued a degree in Music at the University of Minnesota, Twin Cities. Classical music is only one aspect of the music that Laurie loves which is why she has connected so thoroughly with the richness of the Music Together curriculum. After teaching Music Together for a few years, Laurie obtained her Level I Certification (Level I Certification entails demonstrating competency and expertise as a Music Together teacher). These days when Laurie is not spending time with her three active kids, she enjoys the balance of playing her violin, teaching violin privately, and teaching early childhood music education. With loads of business and project management experience gained after college, it was only fitting that Laurie align her passions and experiences by becoming a Licensed Music Together Center Director. 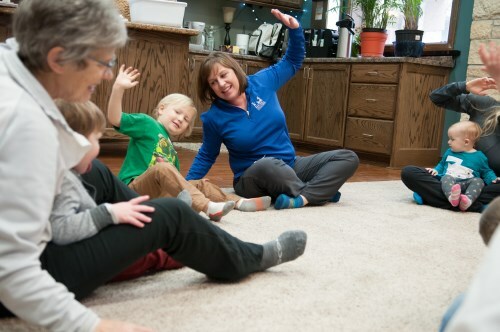 Laurie loves connecting families with music making and looks forward to sharing this passion both as a teacher and center director!